Mobilize Mail can integrate your business systems with your Mobilize Mail account utilising FTP, RSS, XML, SQL. Customised integration solutions can also be developed to suit your requirements. Loosely de-coupled integration where the system interfaces are not needed to be known – the only shared knowledge is the CSV column formats. The third party has not needed to invest in tight integration code and complex integration protocols such as SOAP. Added security as Mobilize Mail does not need to know anything of the third parties systems nor does the third party system need to expose any interfaces. PRE and POST business logic application on subscriber data both incoming and outgoing. The Mobilize Mail Integration Server can apply business logic to your incoming data before the data ends up within your account. The Integration Server can modify incoming data, interact with other third party systems or even update existing data in your account using Mobilize Mail’s Data-Filter technology. An API interface is provided so your own business systems can connect to Mobilize Mail and share data. Any application that can speak XML is supported covering all of the most popular CRM/CMS systems. 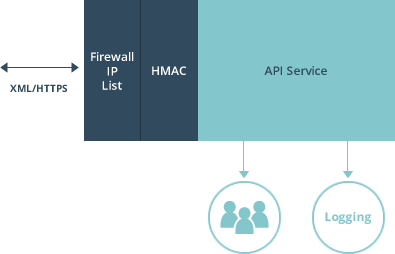 The API interface can also be tailored to suit your individual requirements. Simple POST XML/HTTPS allowing for rapid development that also provides a high level of security (HTTPS and HMAC). Plus numerous services are provided to allow the third party to control the Mobilize Mail account. Full auditing and error logs also allow developers to quickly locate issues and bugs and repair. Non JSON Webhook data syntax–simple HTTP POST of subscriber values (key/value pair). 4 subscriber events: Add Subscriber; Update Subscriber; Unsubscribe Subscriber; Delete Subscriber with “Secret Key” supported. 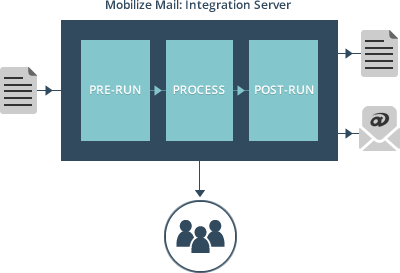 Mobilize Mail Integration Server provides custom-fit solutions for clients who need their systems to communicate with Mobilize Mail. If your system communicates via FTP (push and pull) or XML or RSS or SQL – a solution can be created to cover most internationally recognized protocols or even your own custom protocol. File content encryption support using strong cypher, IV, HMAC and RSA PBKDF2 Key combination.